The Toyoca-44 is a Japanese 4×4 TLR made by Tougodo at the end of the 1950s, during the brief 4×4 camera boom. Different versions exist, notably with manual or semi-automatic film advance. The camera was also sold as Haco-44, Kino-44, Laqon-44 and Tower 44. All the Tougodo 4×4 TLR models have the same basic body, with a classical TLR shape. They have a predominantly black finish, except for the Haco-44 and some manual Kino-44. The front standard moves back and forth for focusing. The focus knob is on the photographer's left and has depth-of-field indications; the advance knob is on the opposite side. The viewing hood contains a sports finder, and the nameplate has an oval shape. The back is hinged at the top and locked by a black knob under the camera, with O and C indications. The taking lens is a Kinokkor 6cm f/3.5 and the viewing lens is a View Kinokkor 6cm f/3.5, again except for the Haco-44. Manual Kino-44, Kinokkor 6cm f/3.5 taking lens no.59245, View Kinokkor 6cm f/3.5 viewing lens. The simplest model has manual film advance, controlled by a round red window on the rear, offset to the left and protected by a vertically sliding cover. The shutter is manually wound by a small lever, and released by a simple button placed below the taking lens. The range of speeds is B, 25, 50, 100, 300. The shutter plate is black, only marked SYNCHRONIZED at the top. The PC synch socket is buried in the front standard, between the two lenses, and there is no accessory shoe. The manual model was only sold as the Kino-44. The main body is black finished and has the KINO–44 nameplate. The leatherette covering is usually black, but at least one example has been observed with gray leatherette. The regular model has semi-automatic film advance, with an exposure counter on the photographer's right. The position and shape of the red window is unchanged, but it is only used to set the position of the first exposure. There is a small sliding button on the right side, certainly to engage the exposure counter mechanism, and an accessory shoe in front of the advance knob. The shutter release and the synch socket are placed the same as on the manual model. There are bayonet attachments on both lenses. The shutter gives B, 1–300 speeds and has a self-timer. Regular Toyoca-44, Kinokkor 6cm f/3.5 taking lens no.62429, View Kinokkor 6cm f/3.5 viewing lens. The regular model exists in black as the Toyoca-44, with Kinokkor and View Kinokkor lenses, and a Toyoca–44 nameplate. Its original case is red, yellow and black, marked TOYOCA–44 40m/m × 40m/m CAMERA. The same model was also sold as the Haco-44, certainly a distributor's brand, with Hacor 6cm f/3.5 lenses, a HACO–44 nameplate, a film reminder on the focus knob and gray leatherette covering. This Haco-44 exists with gray paint or black paint. Gray-painted Haco-44, Hacor 6cm f/3.5 lenses (taking lens no.63578, viewing lens no.63613). Deluxe Kino-44, Kinokkor 6cm f/3.5 taking lens, View Kinokkor 6cm f/3.5 viewing lens. The so-called deluxe model is similar to the regular model but for the Citizen-MV shutter (B, 1–400, self-timer), enclosed in a larger casing with a protruding part at the bottom, containing the release button, the synch socket and an M/X selector with a yellow dot. The red window is the same as on the other models, and the advance mechanism is similar to that of the regular Toyoca-44. Tower 44, Kinokkor 6cm f/3.5 taking lens no.50062, View Kinokkor 6cm f/3.5 viewing lens no.50444. The deluxe model was sold as the Toyoca-44 by Tougodo, as the Tower 44 by Sears, and as the Kino-44 or Laqon-44 by unknown distributors. They mostly differ by the nameplate, respectively reading Toyoca–44, TOWER 44, KINO–44 and LAQON–44, the latter being the most uncommon. Variations are known in the shape of the sliding button engaging the exposure counter mechanism: on the Toyoca and Tower, the configuration is the same as on the regular model, whereas on the Kino, the button is surrounded by a larger cup and slides towards the bottom in a visible slit. The Kino-44 was featured in the October 1958 issue of Sankei Camera, among other cameras specifically made for export. The Toyoca-44 and Kino-44 are mentioned again in the December 1960 issue of Shashin Kōgyō: they are presented as almost unknown in Japan, and mainly made for export. These are the only occurrences reported in Japanese camera magazines. This indicates that none of the Tougodo 4×4 TLR cameras was regularly sold in Japan, except maybe a few Toyoca-44 directly distributed by Tougodo. The trademarks other than Toyoca were certainly owned by various foreign distributors. The Tower 44 was sold by Sears, and appears in the 1959 catalogue by the company. The Haco-44 is sometimes attributed to Haking, probably by mistake. The distributors of the Kino-44 and Laqon-44 are unknown. The original box for the Toyoca-44 is black, yellow and red, and is marked TOYOCA–44 and 40m/m×40m/m CAMERA. The original box for the Kino-44 is black, yellow and beige, and has similar markings with Kino–44 and 40m/m×40m/m CAMERA. It gives no indication on the distributor's name. ↑ Examples pictured in this article, in Sugiyama, item 2133, here and here at Asacame, and observed for sale at a dealer. ↑ Example observed in a past auction by Auction Team Breker. ↑ Toyoca-44: examples pictured in this page, in McKeown, p.932, in this page (archived) of the 44 Club, observed for sale at a dealer, at a past auction by Auction Team Breker and in an online auction. ↑ Gray paint: examples pictured in this page, in McKeown, p.929, and one sold as lot no.717 of Westlicht Auction no.3; see links below. Black paint: example pictured in this page at onetwoseven.org.uk. ↑ The name "Deluxe" is used in Sugiyama, item 2134, in McKeown, p.929, about the Kino-44, and in this page and this page at Asacame. It is not confirmed by any original document found so far. ↑ An isolated example observed has been observed in an online auction with a different back, which does not fit the camera correctly and is covered with gray leatherette, certainly taken from some other 4×4cm TLR. ↑ The 1959 catalogue by Sears shows a hyphen in the nameplate, which is absent on all the examples observed so far. ↑ Kino-44: examples pictured here, in Sugiyama, item 2134, in this page and this page at Asacame, in a page formerly shown at Nana-chōme no tabe and in this page in Dirapon's website, and examples observed for sale at a dealer and in online auctions. Laqon-44: example pictured in Sugiyama, item 2143, and example observed for sale at a dealer. Tower 44: examples pictured in McKeown, p.878, and in this page at www.tlr-cameras.com, and examples observed for sale at a dealer and in online auctions. 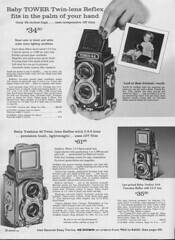 Toyoca-44: examples pictured in this page at Fotomuseet i Osby and in this page at www.tlr-cameras.com. ↑ 9.0 9.1 Kokusan kamera no rekishi, p.382. ↑ Otagi, p.29 of Shashin Kōgyō December 1960: あまり国内で知られていない4×4判二眼レフにトヨカ44、キノ44などもある。これはいずれも国内よりも輸出向きに生産された方が多いようです. ↑ 1959 catalogue by Sears, partly reproduced in this Flickr set by Mario Groleau. Otagi Michifusa (愛宕通英). "4×4 6×6 senchi-han kamera ni tsuite" (4×4 6×6センチ判カメラについて, 4×4cm and 6×6cm cameras). In Shashin Kōgyō no.104, December 1960. Pp.28–9. Sears, Roebuck and Co. Sears Camera Catalog, 1959. Partly reproduced in this Flickr set by Mario Groleau. The Tower 44 appears on p.36. Asahi Camera (アサヒカメラ) editorial staff. Shōwa 10–40nen kōkoku ni miru kokusan kamera no rekishi (昭和10–40年広告にみる国産カメラの歴史, Japanese camera history as seen in advertisements, 1935–1965). Tokyo: Asahi Shinbunsha, 1994. ISBN 4-02-330312-7. Item 1210. McKeown, James M. and Joan C. McKeown's Price Guide to Antique and Classic Cameras, 12th Edition, 2005-2006. USA, Centennial Photo Service, 2004. ISBN 0-931838-40-1 (hardcover). ISBN 0-931838-41-X (softcover). Pp.878, 929 and 932. Sugiyama, Kōichi (杉山浩一); Naoi, Hiroaki (直井浩明); Bullock, John R. The Collector's Guide to Japanese Cameras. 国産カメラ図鑑 (Kokusan kamera zukan). Tokyo: Asahi Sonorama, 1985. ISBN 4-257-03187-5. Items 2133–4 and 2143. This page was last edited on 5 July 2017, at 05:32.